The largest emission-free ferries in the world have been officially welcomed into service after guests boarded Tycho Brahe in Helsingborg, Sweden and Aurora in Helsingør, Denmark on November 9 for a special inauguration ceremony marking completion of the all-electric conversions. 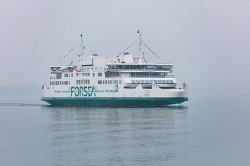 Tycho Brahe and Aurora have been converted from conventional diesel engine operations to battery power at Öresund DryDocks, as part of operator ForSea’s (formerly HH Ferries Group) strategy to reduce the environmental footprint along the 4km (2.5-mile) route between Sweden and Denmark. The vessels operate on a high-intensity ferry route that transfers over 7.4 million passengers and 1.9 million vehicles between urban port terminals. The conversion of these over 100m-long (328ft) ferries, both built in 1991, required installation of a 4,160kWh battery system on each vessel, as well as battery racks, energy storage control systems and ABB’s Onboard DC Grid power distribution technology. 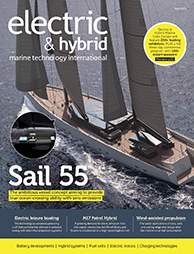 Additionally, ABB supplied automated shore-side charging stations using an industrial robot to optimize the connection time and maximize the charging period, leveraging 3D laser scanning and wireless communication between ship and shore. INEA, the European Union’s executive agency for innovation and networks, has supported the project.